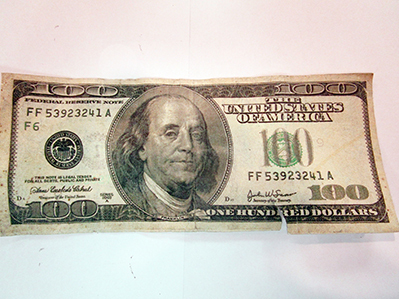 The Artesia Police Department is warning local business owners about the circulation of counterfeit $100 bills in Artesia. Cmdr. Lindell Smith reports several fake $100 bills have been passed at a number of local stores in the past week. The bills pass “the pen test” — through which pens containing an iodine solution are used to test whether paper currency is wood- or fiber-based — but can be spotted as counterfeit upon closer inspection. On Wednesday, a fake $100 bill bearing the serial number FF53923241A was passed at AutoZone. Thursday, a local Brewer station received a fake bill bearing the same serial number. Delay the passer with an excuse, if possible. Observe the passer’s description – and descriptions of their companions, if any – and write down their vehicle license plate numbers if possible. Contact the APD or the U.S. Secret Service Field Offices in El Paso, Texas (915-532-2144), Midland, Texas (432-682-9900), or Lubbock, Texas (806-472-7347). Write your initials and the date in the white border area of the suspected counterfeit note. DO NOT handle the counterfeit note. Place it in a protective cover, a plastic bag, or an envelope to protect it until it can be placed in the hands of an identified Secret Service agent. Surrender the note or coin ONLY to a properly-identified police officer or Secret Service agent. More tips on the identification of counterfeit currency can be found at www.treasury.gov/about/organizational-structure/offices/Treasurer-US/Pages/if-you-suspect.aspx.